In April 2013, we begin a periodic guest blogging series where we invite frequent researchers to discuss their projects. Our first comes from Sasha Reuther. Sasha Reuther is a Producer/Director of commercials, music videos, and historical programming for networks and clients including National Geographic, Sundance Channel, VIBE Magazine, Armani, Motorola, and The Starwood Hotel Group. His first documentary feature, Brothers On The Line, is an award-winning historical odyssey exploring the lives of labor organizers Walter, Roy, and Victor Reuther (his grandfather) and their extraordinary, though equally contentious, leadership of the United Auto Workers union. Aside from his film work, Sasha has written articles for Time Magazine, Huffington Post, and The IFP. Born in Detroit and a graduate of NYU’s Tisch School of the Arts, he lives in NYC with his wife, Sonya. My introduction to the Reuther Library was quite surreal, like flipping through a vast and intimidating family scrap book. 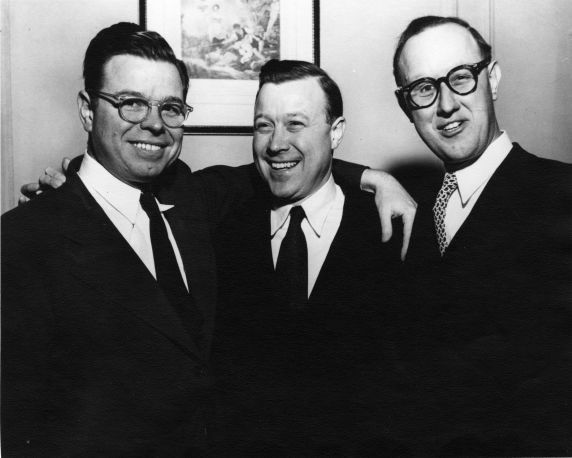 As the great-nephew of Walter Reuther, I grew up around stories of the Reuther brothers’ social justice crusade. As a budding filmmaker, the tales sparked my imagination and presented the potential of dramatic cinema. Visiting Wayne State University in early 2007 to begin the research for what would become my first feature documentary, Brothers On The Line, the labor archives were an audio-visual feast of discoveries and challenges. The allure of historical filmmaking is assembling a distinctly new picture from the pieces of 100 previous puzzles. It’s breathing life into a forgotten newsreel, incorporating a subtle gesture from a family home movie or photo, and eventually finding a common thread in the seemingly unrelated. It was encouraging to feel a shared enthusiasm from the ever-accommodating Reuther Library staff as I set out on this production journey. For the most part, their holdings are an under-appreciated archival resource in the realm of film/video projects. Sasha Reuther (right) and cinematographer Joe Gabriel (in hat). At the outset, I knew that the United Auto Workers and CIO, with their in-house newspapers and photographers, had documented an extensive amount of the labor movement, even as early as the 1930s. Expecting to review stacks of pictures and documents in the general reading area, I was stunned to be led into a cold-storage room filled to the ceiling with motion picture and audio spools. Eagerly consuming reel after reel, the first-person live-action was priceless: UAW President Walter Reuther in a heated exchange before the Senate Committee on Campaign Contributions (“I am not a second-class citizen and I don’t intend to start acting like one!”); Roy Reuther’s oral history with play-by-play accounts of the strategy behind The Flint Sit Down Strikes; and my grandfather Victor, the UAW-CIO’s International Director, delivering a rousing speech in the native tongue at a massive May Day rally in West Berlin. A treasure of emotive imagery, I reworked my story treatment as fresh scenes would unfold. But, the excitement of uncovering the occasional gem was few and far between. In reality, it was a mostly tedious process of identifying and logging content. As with any large library, it is an impossible prospect for the archivists to have cataloged all of the persons and places that appear. A number of the film boxes had not been cracked open in years, many with missing or incomplete labels. Days in the screening room grew long, as I had an intense curiosity to keep digging. What if the perfect shot was right on that next shelf? Thankfully, time and budget constraints pulled me down out of that cloud, and we amassed an ample collection of material nonetheless. Since there had been little produced on the Reuthers in this medium, I was not obligated to tell the “latest” version of their story, like those who might approach a film on the Kennedys. With that freedom however, came the daunting task of condensing a saga that spanned over 4 decades, while maintaining factual accuracy and a broadcast-friendly running time of less than 90 minutes. I relied heavily on a stellar team of advisors, including Mike Smith and Steve Babson from Wayne State, and am especially grateful to my editor, Deborah Peretz, who encouraged the presence of a dissenting voice throughout the film. It was guidance that I would pass on to any Director crafting a personal history. It is essential to remain a filmmaker first and try to reserve family emotions as much as possible. Test screenings revealed that some of the most engaging scenes in Brothers On The Line are those that offered a critical take on the Reuthers’ rise to power and political compromise -- ideal counterpoints to their heroism. The alternative is a slippery slope into hagiography. A crucial pre-production undertaking was to map out the distribution plan for the film. My co-producer, Nancy Roth, and I reviewed the path of similar documentaries and where they were most successful (educational market, consumer home video, broadcast, etc.). When planning to utilize archival imagery, it is important to note that there are often several licensing price tiers, depending on the scope of release. Aside from the Reuther Library, we acquired material from other sources, including CBS News, Getty, Fox Movietone, and The National Archives. In the long run, it was much more cost-effective to spend the extended man-hours researching and transferring materials from the Reuther, than paying the steep per-second footage fees at a ready-to-use stock house like Getty. We finally completed Brothers On The Line in early 2012 and have since been on a film festival and specialty screening tour. While the “Best Documentary” honors are undoubtedly exhilarating, the greatest reward of this creative exploration is the audience response. The post-screening discussions are a communal, at times therapeutic, experience: a personal anecdote shared by an elder or an inquisitive high school student who correlates the themes of the film with what is (or should be) happening in the labor movement today. The highest praise is always saved for the rich archival footage and sound recordings. I am hopeful that this initial collaborative effort with the Reuther Library will continue to encourage curiosity in labor studies, inspire the next generation of activists, and entice another non-fiction cinema junkie to explore the depths of a tremendous resource. For more on the film, please view the Brothers On The Line tumblr.